Cutting down the chatter on the less interesting lists can be important. Getting every update from everyone will get a little overwhelming and you will miss important stuff from your other friends. Personally, I’m going to use this to stop all those damn Game updates. Select each list and then Manage List… to bring up these options, via Choose update types…. Most are self explanatory, I think, but perhaps a couple need to be looked at more closely. 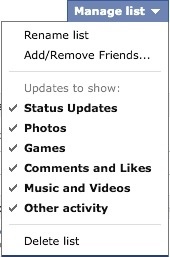 Status Updates: the main updates from the web portal and most mobile apps (Facebook for iPhone, for example). Other Activities: guess this is everything else. What isn’t clear is whether app updates (NetworkedBlogs, SelectiveTweets etc.) are included. So we need to think carefully about Other Activities. It can interfere with items that you might consider to be in the first, Status Updates. Remember that you can do this on Acquaintances but you’ll only get major events anyway, whether you do this or not.